Just because Hayao Miyazaki has announced his retirement from Japanese anime powerhouse Studio Ghibli doesn’t mean you should assume things are going downhill immediately for the animation titan – take The Tale of the Princess Kaguya, for instance, which up to a point is able to recapture the same whimsical nature of Miyazaki’s own directorial vision while also being its own product. Directed this time by Isao Takahata, the Grave of the Fireflies director who here makes his first film for the company since 1999’s My Neighbours The Yamadas, the film takes its inspiration from a classic Japanese folk story with elements of the supernatural subtly mixed with a thoughtful riff on traditional Eastern customs. When it focuses on the latter constantly throughout its middle section, which is the most difficult to sit through due to its incredibly slow pace, it can lose just a touch of its potential. It’s this section where the narrative suddenly becomes looser and more inconsistent, focusing a little too much on sub-plots that don’t need that much focus at the end of the day. 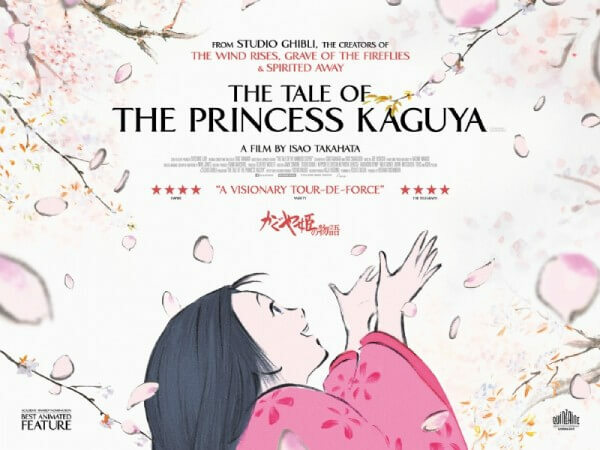 For instance, when young Kaguya (voiced by Chloe Grace Moretz in the English dub, which is the version covered in this review) is formally made a Princess by custom and is presented a chorus line of suitors, she instructs them to find almost impossible items and bring them to her in order to win her hand. This would probably be ripe for a brief comic set-piece, lasting around four to five minutes, but it goes on for what feels like thirty – the film goes into great detail about what the suitor has brought to her as requested, but all you’re left wondering is how in any way does this contribute to the plot or even warrant such a large amount of screen-time. It’s safe to say that this section of the film is the one where you’ll probably start checking your watch more often than usual. What DOESN’T cause that same effect, however, is the beginning and ending of the film, which is where the film truly becomes alive and spirited. The beginning goes straight into fairy tale mode, with the magical appearance of a small girl in a bamboo stalk who rapidly grows from a baby into a teenager in the span of a few weeks or months, and how James Caan’s bamboo cutter who finds her and his wife (Mary Steenburgen, who also provides narration) raise her like normal parents. This is arguably when the film becomes the most playful as we see the magic truly settle in to the proceedings, such as when the wife’s breasts suddenly alter to provide milk for the infant, or how Kaguya learns to stand on her own two feet moments after mastering crawling. It’s a lovely portion of the film, and you’re desperately wondering if this feel will be recaptured by film’s end. Sure enough, after that dragged-out (but by no means terrible) middle section, it returns to that magical fairy tale element for its conclusion, with a major revolution regarding Kaguya’s origins and an unstoppable supernatural force that almost takes it into sci-fi territory. The visuals and ideas become more dream-like, both figuratively and literally, and without giving anything away it hinges on some major emotional beats which make it hard to not get a little sniffle out by the time it finishes proper. The film also boasts a very distinct and unique animation style, incorporating much more pencil-drawn imagery than the Technicolour wonders one usually associates Studio Ghibli with, with everything appearing more sketchy and hand-crafted than most we’ve seen before from the studio. This brings a very simplistic feel to the film, which fits well considering this is a very simplistic story based on a very simplistic folk tale – but at times, it can limit some of the film’s visual creativity by sticking firmly to the page (most frames look like tightly-drawn paintings) and not branching out as often as it wants. There is one scene that reaches those heights, where Kaguya runs away after getting her feelings hurt and the animation becomes more rugged and even aggressive as she runs further, but it is only one scene and the rest of the film adopts that plain style. It’s beautiful to look at regardless, but when you take into account Ghibli’s other animated wonders it can’t help but feel a little lacking. 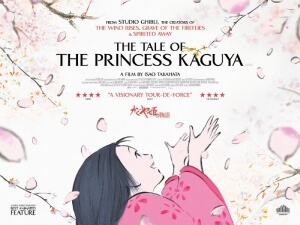 It’s still worth recommending The Tale of the Princess Kaguya to any lovers of this type of anime, however, and for Ghibli fans it should serve as a visual delight to accommodate for the gaping hole left by Miyazaki. The Tale of the Princess Kaguya serves up a unique and breathtakingly beautiful (though at times limiting) animation style with a magical fairy tale element throughout that not even a slower middle section can deter.